On some VIA Rail routes, you can get off and on the train exactly where you want — even in places where there is no scheduled stop! The ideal solution for outdoor activities - at that little lake deep in the forest, or that wild river you've been dreaming of for so long! It's only valid on some routes, and only with at least 48 hours notice, but it seems an interesting idea. I've previously made of use of a similar thing on the long distance CityLink buses in the Scottish Highlands (from a typical timetable: pick up at all the stops listed above and all bus stops and intermediate points where it is safe for the coach to stop following a clear signal being given by the intending passenger), and I know a lot of regular rural buses do a similar thing too. However, I've never come across trains doing this before. Is this a special Canadian thing, or does it happen elsewhere in the world too? Wikipedia seems to feel that even just stopping/not stopping at an official station is pretty rare and mentions only Canada as a place where you can stop "at any milemarker" on request. I can see this making sense North of Superior. Actually, I would love it when travelling between Oshawa and Montreal, since the train goes right past a place I would prefer to get on and off, but I know they would never do such a thing on a "corridor" route. In the far reaches of the network, the stations can easily be hours apart. I suspect most places in the world that have a sparse population don't have a train network, and most places with a train network are dense enough that stations are 30 min or less apart. As well, Canada has a number of places that are reachable only by train, plane, or large boat - meaning if the train doesn't let you off there, you can't get yourself to it at all. 2018 update: a Twitter thread with more details and a link to the Via page about it. The thread includes past examples of other places this happened, but none that are current and outside a station. 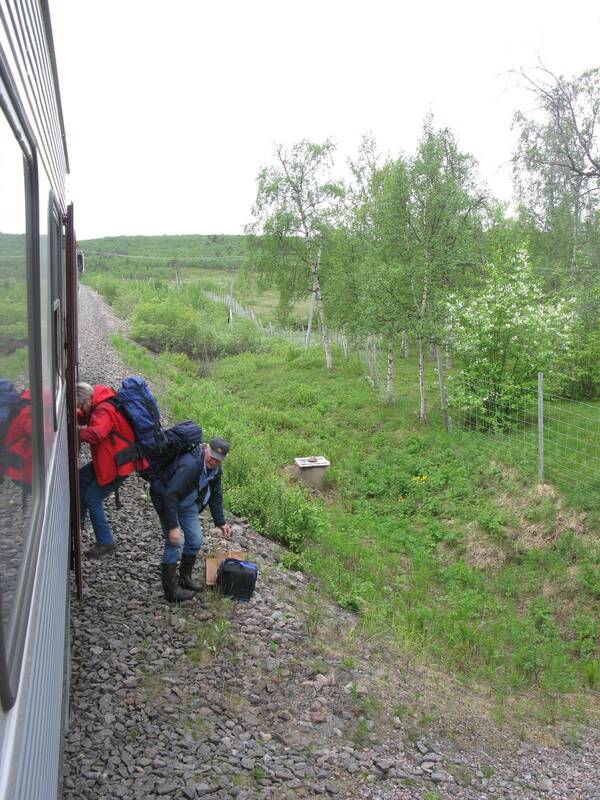 To build on Kate's answer, Wikipedia also mentions that this practice is possible on the Alaska railroad. There are also a number of flag stops on the Amtrak train network in the US. Flag stops are fixed locations in which the train will only stop if there is a passenger waiting and/or if a passenger wishes to depart. I want to say that there's some lines out in the Siberian and Far Eastern stretches of Russia that allow you to do that, but I cant' seem to recall where I got that information. Outside of that nope, never heard of such things outside of Canada. Officially, such a thing certainly does not exist in Sweden. Early summer, somewhere in the area around Kiruna. There is a cabin along the railway here, formerly used by a railway employee but now privately owned. Later, a local friend told me he had sometimes phoned his friend at traffic control so that a train could pick him up or drop him off at some remote stretch of railway. He told me they'd do it for others as well (secret grandfathered policy) but I never tried. Only along the northern parts of Malmbanan, between Gällivare and Abisko or so. On top of that, I suspect it's also quite possible on the Inland Line, a line that now only has trains for tourists and only in summer. For what it's worth, this is only really available on the Sudbury-White River (formerly Lake Superior) route on Via. Having used this to traverse the north quite often when I was younger, it was not unusual to see people alight from various locations that weren't stations - including with quads or watercraft. (Usually canoes). This is indeed a thing, and very neat. I've seen this on the Polar Bear Express between Cochrane and Moosonee, Ontario, though that is an Ontario Northland train rather than Via. Virtually all the "stations" between those two are flag stops that seem to exist solely for ticket pricing purposes, the few people not travelling the whole distance got off elsewhere. Not the answer you're looking for? Browse other questions tagged trains public-transport canada via-rail or ask your own question. Visit Northern Ontario from Toronto without a car? How different are US weigh stations for trucks than Canadian ones?